Business wasn’t going well in America, and an opportunity arose right before his eyes that he could not say no to. He boarded a plane and went on a short trip to Ethiopia to help with a project of saving children that had been left to die because they were believed to be cursed. These children are called mingi children and they may be condemned to die for a number of reasons. Levi worked with the newborn orphanage for these children for just a few short weeks, but he knew there was no way he could go home and forget the children he had seen in Ethiopia, and the hopelessness that was their lives. Once he arrived back in America, he began the process of shutting down his business and packing up his wife and three children to move to Ethiopia. Levi and his family made it to Jinka, Ethiopia, and they began working with the mingi children by providing funding and management for the new orphanage. Most things were done by Ethiopians, but Levi and his wife Jessie provided a lot of brainstorming and implemented a lot of changes to help benefit the children living in the orphanage. No Greater Love walks you through the joys and trials that Levi and his family faced during their years in Ethiopia. There were great excitements as they saw children rescued and given new hope, and there were deep sorrows when adoptions fell through and the tribal elders tried to shut down the work that was happening. This is a book you should read. Levi recounts the years in Ethiopia very candidly and does not hide the difficulties that he struggled with or the despair that he felt. This is a real man with a real family that was doing a real work for God. He did not make the right decision every time, but he didn’t hide that. He took the failures that he experienced and he let God use them for His glory. Christians are called to glorify God, through their lives, through advancing the Gospel, through loving our neighbors. This book will challenge you to think through what you are doing presently to glorify God. How are you demonstrating love, and who are you picturing Jesus to? To be completely honest with you, I was caught up in the details of this story, for I am captivated by the story of adoption, and I cannot comment much on the literary qualities of the book. 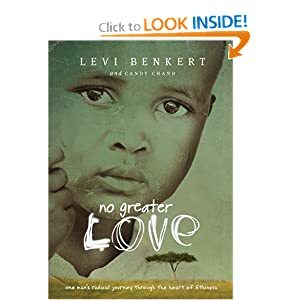 The book is written in a very conversational manner, and it is as though you are sitting down to coffee with Levi and hearing about how God has changed his life and challenged his faith in Ethiopia. I do recommend that if you are interested at all in what God is doing in the world at large, you should read this book. God is alive and offering hope to children around the world.